The finest quality and best tasting mangoes in the world! 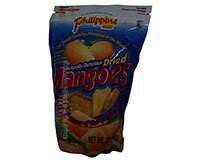 Philippine Brand 100% Natural Sweetened Dried Mangoes are without a doubt the best tasting Dried Mangoes in the world! For centuries the region of Cebu's warm sultry climate and fertile soil has been ideal for propagating the most delicious mango variety. This ORIGINAL brand dried mango has a non-acidic sweet and delightful texture that is unmatched by any other dried fruit product. After experiencing just one bite, you will understand why the Philippine mango is famous for its quality flavor and natural goodness! Philippine Brand Dried Mangoes are lush, sweet, and tasty. Nothing but the true taste of mango goes into every bite! Delicious, rich in vitamins and 100% fat free, Philippine Brand Dried Mangoes are a healthy alternative for an all day snack.